Affordability constraints have put the brakes on national value growth, particularly in high-value regions. Dunedin continues to see the strongest value growth out of all the main centres, while steady growth continues in Wellington and values drop slightly in Auckland. Dunedin, with an average value of $451,199 - well below the national average of $686,523 – has seen solid growth for yet another month. Wellington City saw values rise modestly, up 1.9% while Auckland saw values City saw values drop 0.2% over the past quarter. 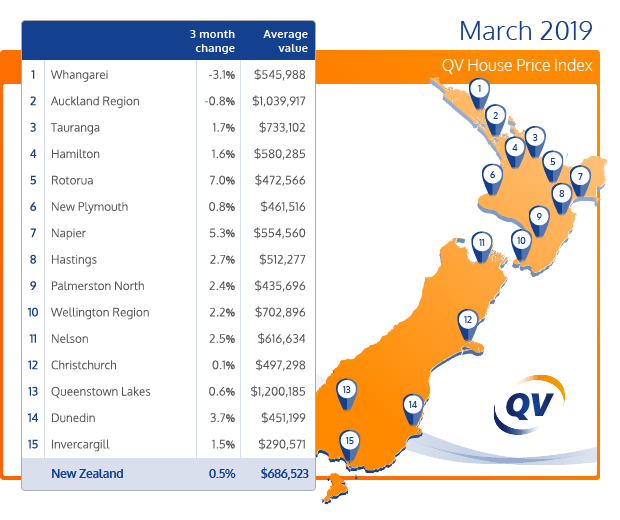 The latest QV House Price Index shows nationwide residential property values have increased steadily over the past year by 2.6% and by 0.5% in the three months to March. Meanwhile, residential property value growth across the Auckland Region decreased by 1.5% year on year and by 0.8% over the past quarter. The average value for the Auckland Region is now $1,039,917. Value growth remains slow across Auckland's suburbs. North Shore values dropped 3.1% in the year to March and by 1.2% over the past three months. The average value there is now $1,197,945. The former Auckland City Council central suburbs dropped 1.1% year on year and by -0.2% over the past three months and the average value there is now $1,230,817. Waitakere values decreased by 1.3% year on year and by 1.1% over the past three months. Manukau values decreased by 1.1% year on year and by 1.5% over the past three months; Papakura values decreased 1.7% year on year and by 1.4% over the last quarter and the average value there is now $691,235; Franklin values dropped by 0.5% year on year and Rodney values were up 0.3% year on year. quarter; Porirua rose 8.9% year on year and by 1.1% over the past quarter. Finally, the Kapiti Coast rose 6.8% year on year and 1.7% over the past three months. Hamilton City home values increased by 1.6% over the past three months and by 4.5% in the year to March. The average value in Hamilton is now $580,285. Tauranga home values rose 3.7% year on year and by 1.7% over the past three months. The average value in the city is $733,102. The Western Bay of Plenty market rose 1.6% year on year and dropped 1.0% over the past three months. The average value in the district is now $647,838. It’s a continuation of recent trends for Christchurch City, with value growth remaining modest. Values are slightly up year on year and slightly increased by 0.1% over the past three months. The average value in the city is now $497,298. Dunedin residential property values are continuing to rise and have increased 13.3% in the year to March and by 3.7% over the past three months. The average value in the city is $451,199. The Dunedin – Taieri area experienced strong value growth, up 12.5% annually and 4.0% over the past quarter. Nelson residential property values rose 8.9% in the year to March and by 2.5% over the past quarter. The average value in the city is now $616,634. Meanwhile, values in the Tasman District have also continued to rise, up 6.4% year on year and 1.6% over the past three months. The average value in the Tasman district is now $598,826. Otorohanga leads the way in quarterly growth, up 20.2%, followed by Rotorua (7.0%) and Central Hawkes Bay (5.7%). In terms of annual growth, Kawerau leads the way, up 24.2%, followed by Wairoa (22.4%) and Tararua (21.7%). Southland lead the way in quarterly growth, up 9.2%, followed by Clutha (7.4%) and Westland (6.5%) Dunedin – South leads the way in annual growth, up 15.1% followed by Dunedin - City (13.3%) and Dunedin (Central and North), up 13.0%. For all media queries, please contact our National Spokesperson Rory Milne on 04 576 4434.